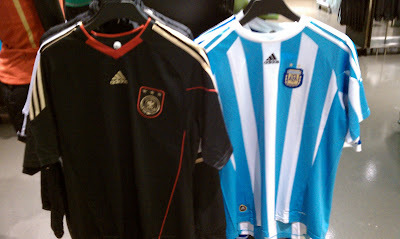 Dodgy At Best: Argentina-Germany. Rematch of 1986, 1990 Finals, 2006 Quarterfinal. It Doesn't Get Any Bigger Than This. 2006 Quarterfinal. It Doesn't Get Any Bigger Than This. Germany v Argentina. 5 World Cups between them (Germany 1954 ,1974, 1990 & Argentina 1978, 1986), and they have met 11 times before in World Cup history, with each team winning 4 each and 3 draws. The 3 most famous encounters of course are Argentina beating Germany in the 1986 final, Germany turning the tables and beating Argentina 4 years later in the brutal 1990 final, and their 2006 quarterfinal where Germany came from behind and then won in a penalty shootout. Oh, there is also considerable bad blood. The 1990 final was brutal and cynical, and after Germany won the penalty shootout in the 2006 quarterfinal, chaos ensued on the field and a figt broke out between members of the Argentine & German staff. So this will be another match that if nothing else is incredibly intense. What is there to say, really? If you've read Carlo's preview and/or Zonal Marking's tactical preview, there's not anything I can really add as far as insight. I will just give you a thorough recap of their quarterfinal clash in the 2006 World Cup, and I'll tell you that I think the difference in this game may simply be the ridiculous depth of Argentina, and the talent they can bring off the bench to change the game in the final 20-30 minutes. Germany are great and young and exciting, but I think Argentina's talent is too much and they advance to the semifinal to take on the winner of Paraguay-Spain(which will be Spain). The winner of that match will then play Netherlands in the final for the whole ball of wax. I also have a feeling that best player on Earth Lionel Messi, who has been amazing per usual all world cup but who hasn't scored goals yet, will have a breakout game and score a goal or two in a virtuoso performance.